Confession: I have a slight obsession with buying children's books. Thankfully, my son loves reading almost as much as I do. It would be a bit embarrassing if I had to read them by myself. It should be no surprise that the theme for my son's first birthday was based on a classic - The Very Hungry Caterpillar. 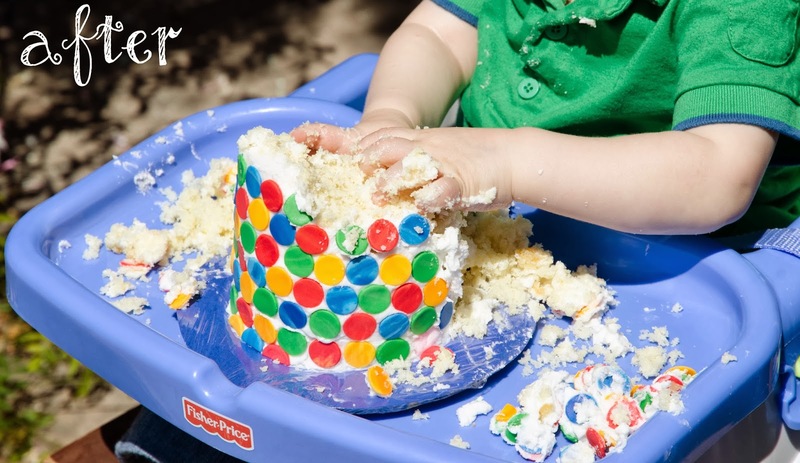 With my son's second birthday around the corner, I have been fondly remembering how much fun we had at his first. 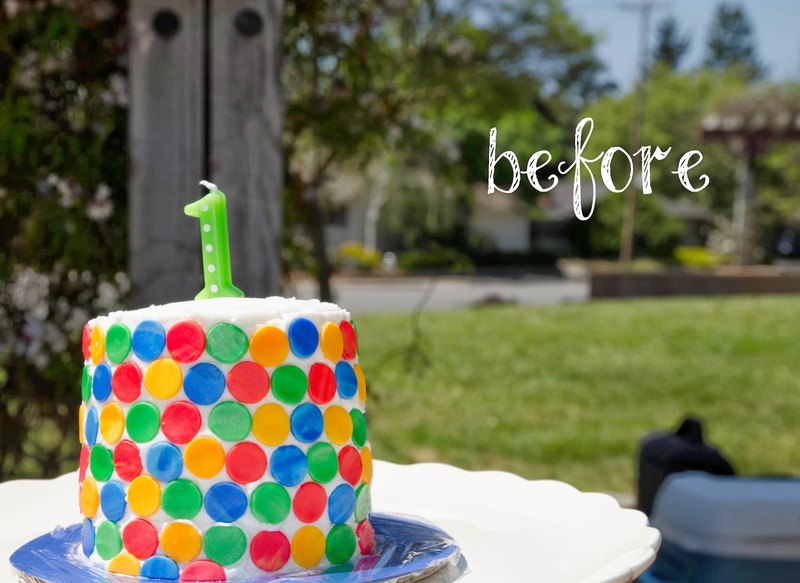 Here's a little photo inspiration for fellow party DIYers. I found a free downloadable hungry caterpillar image online here and designed my own printable invitation. A hole punch down the side matches the caterpillar's trail of eaten food from the books. Delete the party details, type 'Thank You' across the top, and you have matching thank you notes as well. I loved the idea of a tiny 'smash cake' just for the birthday boy. I had just taken my first cake decorating class so this cake is far from perfect, but I love its color and whimsy. My inspiration was the colorful polka dots from the introduction of The Very Hungry Caterpillar. To get the 'marbled' look of the dots, I hand twisted and rolled out fondant of two different shades of each color. I did not use fondant to cover the entire cake so my son would have an easier time with the 'smashing'. 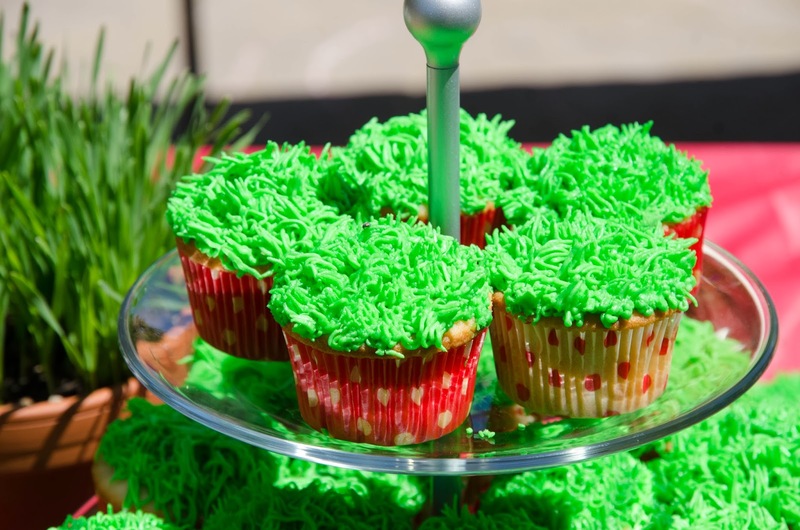 The rest of the guests got green grass cupcakes and chocolate filled strawberries. Filling the strawberries instead of dipping them really helped with the mess. Thanks Pinterest:). Apart from the caterpillars, polka dots were a primary theme through the decorations. 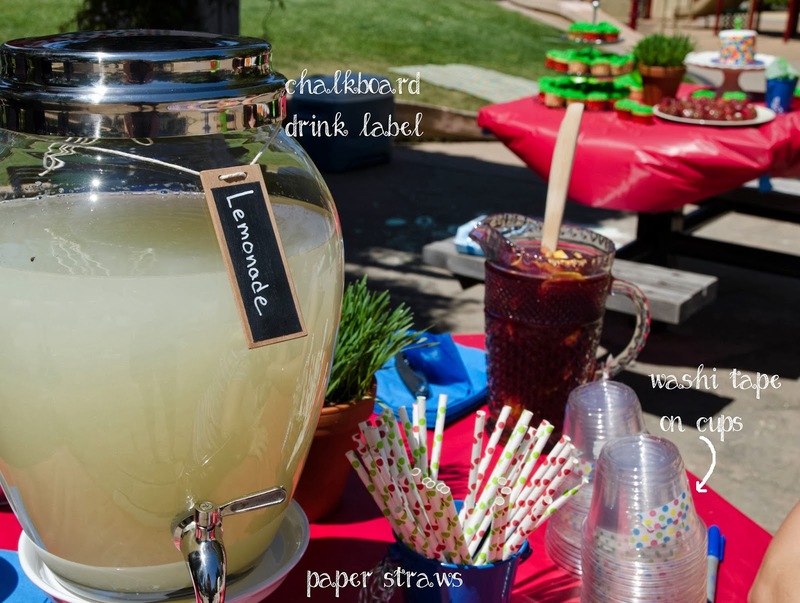 Tablecloths, washi tape on plastic cups, paper straws, cupcake wrappers, a birthday banner...I put polka dots everywhere. Green leaf garlands (also caterpillar 'eaten') and wheatgrass centerpieces added the final touches to the decorations. The wheatgrass was incredibly easy, cheap, and grew in 10 days! I found wheatgrass seed packets at Whole Foods. The green leaf garlands were cut with my Silhouette Cameo. And finally, the favors. 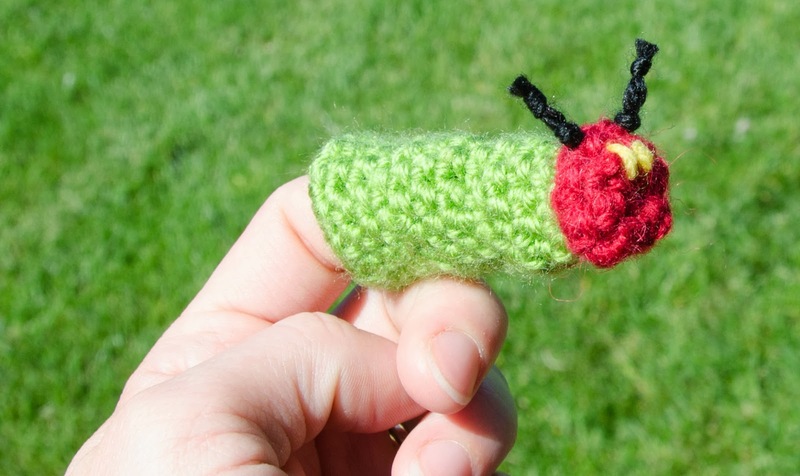 I had my heart set on giving the kids caterpillar finger puppets and there were zero good options available. With a little trial and error, I came up with a simple crochet pattern you can find in my Etsy shop. However, consider yourself warned that hand crocheting finger puppet favors can (in some circles) put you into that 'crazy mom' category. Obviously, I would think you were awesome and ask you for the pattern. Who can blame you if you get a wee bit excited for your kids first birthday? To wrap the favors, I found a Silhouette Cameo pattern for an apple box. I added a few holes and used the same invitation caterpillar image to make tags. I was so happy with the theme. Such a classic resonates with babies and adults alike, and the beautiful artwork and whimsical story offered a ton of inspiration for DIY decorations. There are so many options! 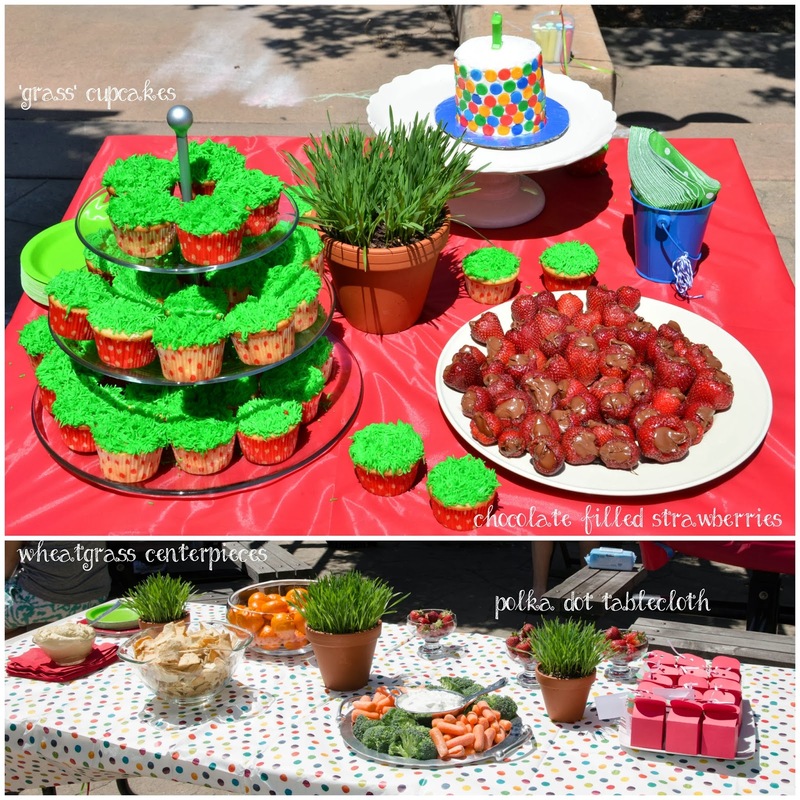 I hope you found a little inspiration from our version of A Very Hungry Caterpillar First Birthday. But most importantly, enjoy celebrating your little one.